Having already covered Spencer Street and Chapel Street, Urban.com.au today focuses on the construction occurring along what is arguably Melbourne CBD's premier street - Collins Street - and its future development pipeline. Stretching approximately 3km from Spring Street to Docklands, Collins Street currently has nine projects either approved or under construction, with the greatest concentration located towards the western end of the CBD at the threshold between the Hoddle Grid and Docklands. These projects are illustrated in the diagram below, with each covered in more detail below. Highlighting development along Melbourne's Collins Street. 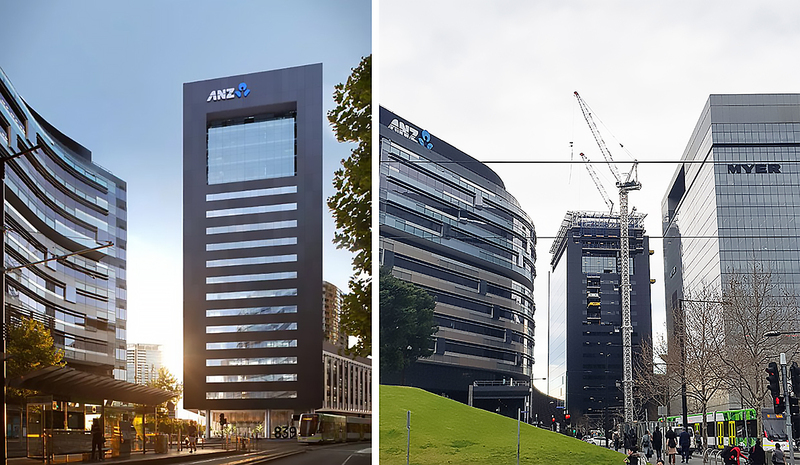 The new 21-storey building for ANZ has topped out for some time with facade installation progressing externally and interior fit-out works having commenced. Designed by Denton Corker Marshall, 839 Collins Street represents the final commercial building to be constructed within Lendlease's Victoria Harbour development. The developer's focus now shifts to the Collins Wharf sub-precinct, extending along the length of the peninsula towards the Bolte Bridge. 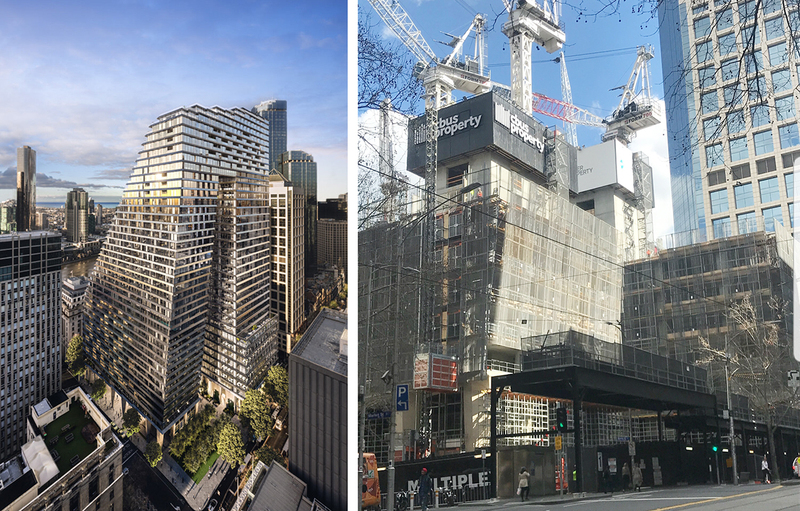 With the finishing touches being applied to One Melbourne Quarter, Lendlease has now turned its focus towards Two Melbourne Quarter. Construction has commenced on the next 25-storey office tower designed by Woods Bagot. Energy Australia will occupy 12-storeys within the tower, accounting for 22,000 sqm of the 50,000 sqm NLA office space. Completion is expected during 2020. 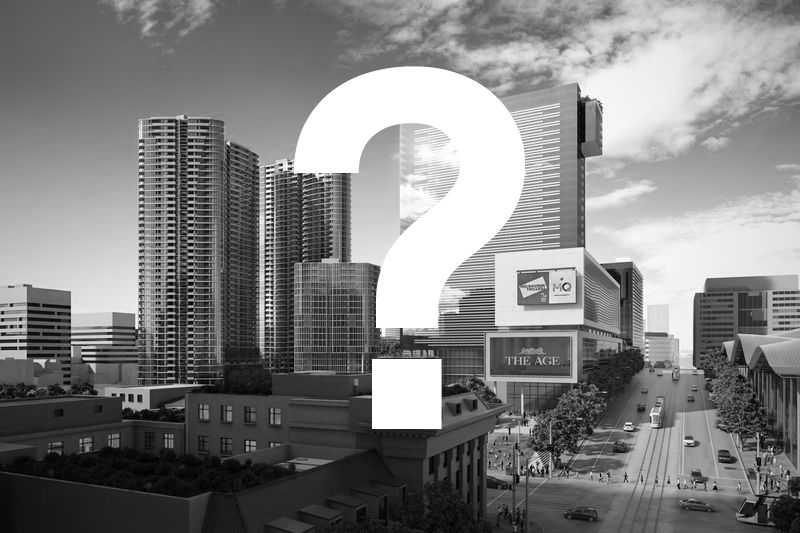 Melbourne Quarter Tower is due for a redesign. 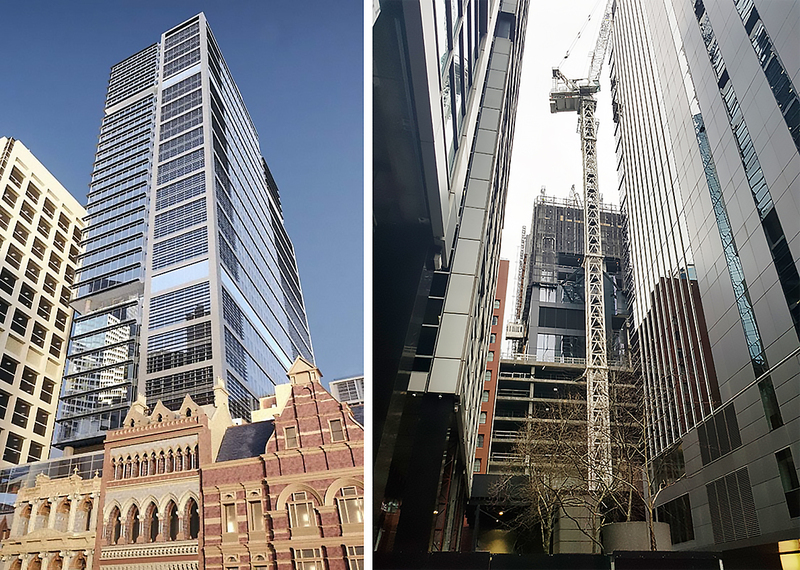 Following planning approval, speculation is rife that Melbourne Quarter Tower is currently undergoing redesign, with a new architect inheriting design responsibilities for Melbourne Quarter's tallest office building. The current permit allows for the construction of a 28-storey office tower of 55,000 sqm NLA. Owners Landream last year announced that they had signed on Mandarin Oriental to operate the hotel component of their $852 mullion development designed by Zaha Hadid Architects in partnership with Plus Architecture. Mandarin Oriental will occupy levels 6 to 24 which exuates to 196 guest suites. Though no firm start date has been confirmed although a tentative completion date of 2023 has been previously floated. Landream secured the site for $60m in 2015 from the Henkell Brothers. The current Enterprise House on site has a date with the wrecking ball, with demolition expected to get underway this month to allow for the construction of Fragrance Group's 47-storey tower. Designed by Bates Smart, the pleated building rises from a truncated base which allows for the provision of a pedestrian plaza and improved pedestrian circulation through the site and around to King Street. 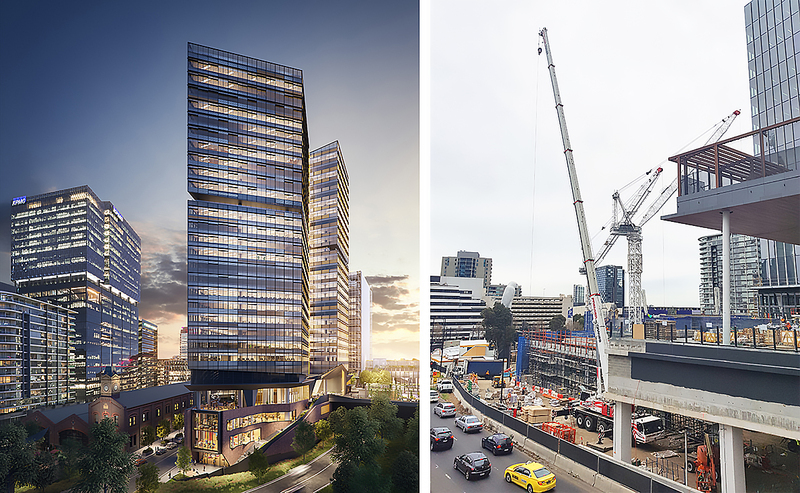 Mirvac recently announced that it had signed global law firm Norton Rose Fulbright, who will join anchor tenant Deloitte in the Grimshaw-designed tower currently under construction. Norton Rose Fulbright will occupy the top floors, committing to 5,100 sqm on levels 35 to 38. Upon completion Olderfleet will be provide 38 storeys of Premium Grade office space. The project will also include the restoration of the historic Olderfleet Buildings which will link to the new tower via an expansive 30 metre high atrium. Golden Age and Asia Pacific Group's Collins House is quickly rising however you could be forgiven for thinking it was completed, such is the manner of construction. Set to become the slimmest tower in Australia with 271 apartments across 60 storeys, the Bates Smart-designed building cantilevers 4.5m over the neighbouring building. In dealing with such a constrained site, builder Hickory employed conventional formwork up to level 14, with the remainder of the tower being constructed with prefabricated modules. By utilising its HBS construction method, Hickory are able to service the project via a single tower crane, with major elements fabricated off-site and then assembled on-site. This has resulted in a 30% reduction in the overall construction programme expected to last 29 months, with completion in September 2019. As reported on Urban.com.au last week, the commercial component of Collins Arch recently received a platinum level WELL Precertification. The twin-tower development which is linked via a tapered skybridge will ultimately deliver 50,000 sqm of premium grade office space, a W Hotel-branded 5-star hotel with 294 rooms, 1,000 sqm of high end retail and 185 apartments. 2,000 sqm of public open space will also be delivered as a part of the development via partial closure of Market Street, upon completion in 2020. QIC Golbal Real Estate's office development at 80 Collins Street is flying up, with Multiplex at the helm of the steel framed structure. With the 12 metre cantilever now complete the first signs of glazing have begun to emerge on the third Woods Bagot design on the list. The project includes extensive retail to Collins and Exhibition Streets, with a NEXT branded hotel designed by UN Studio located on Little Collins Street due for completion late next year. 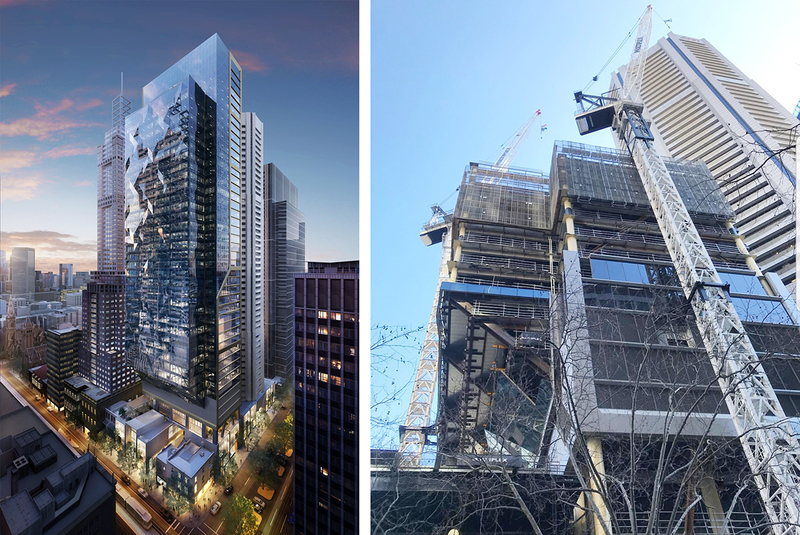 80 Collins Street will also include an Australian-first with double-decker lifts servicing the 39 storey office tower. Not a construction project as such but one to keep an eye out for according to sources within the industry. The Reserve Bank of Australia are looking to sell the 15 storey building on the corner of Collins and Exhibition Streets after vacating it. 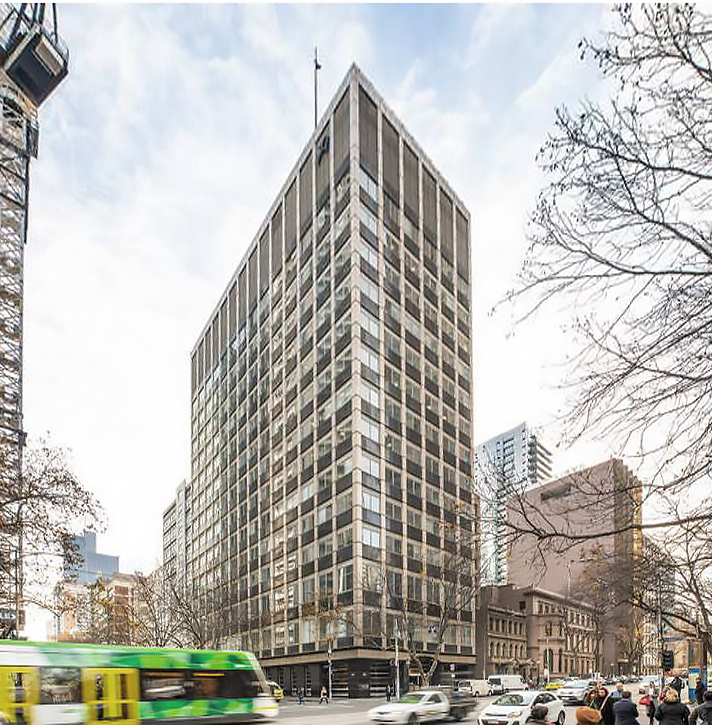 60 Collins Street will form the basis of its own article in a similar vein to this study on 140-150 Queen Street. The Reserve Bank building is heritage listed, so probably not huge redevelopment potential. It's covered by a Heritage Overlay (HO504 - Collins East Precinct) and adjoins Melville House (HO566) but I can't find 60 Collins Street on any registers as an individually significant building?